Ambush, the second of the Royal Navy’s potent new Astute Class attack submarines, sailed into Her Majesty’s Naval Base Clyde today to begin sea trials. The 7,400 tonne submarine sailed from the shipyard in Barrow-in-Furness in Cumbria, where she was built, to HMNB Clyde in Scotland. They feature the latest nuclear-powered technology, which means they never need to be refuelled and can circumnavigate the world submerged, manufacturing the crew’s oxygen from seawater as she goes. “Ambush’s arrival at her home port to begin her sea trials marks a key milestone in the Astute Class submarine programme and is testament to the skills of those involved in the UK’s world class submarine building industry. "Ambush is an immensely powerful and advanced vessel that will deliver an important capability to the Royal Navy giving it the versatility and technical excellence needed to operate successfully across the globe." 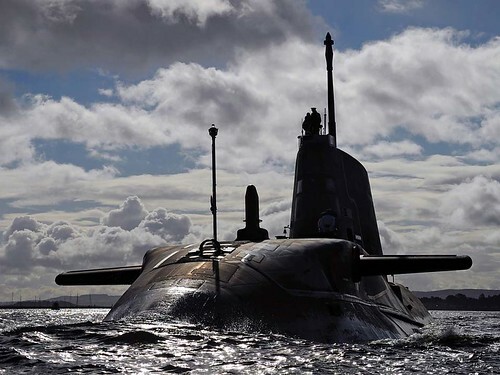 The Astute Class is quieter than any of her predecessors and has the ability to operate covertly and remain undetected in almost all circumstances despite being fifty percent bigger than the Royal Navy’s current Trafalgar Class submarines.